A four part webinar series consisting of four 90 minute sessions will begin on February 10th. Coach Gonzalez will be presenting material not included in this series. We are excited about depth and detail of what he is presenting. More information and registration will be available later today. Email me grabkj@gmail.com. Put “Gonzalez” in the subject line. Upon your registration you will receive a code for A Coaching Arsenal iBook and be entered in a drawing to win 5 Coaches Edge current or future titles of your choice. From The Need For Change by Dan Gonzalez. Accountability. The very word seems, at times, lost in today’s society. One of the things to love about sports (and our sport in particular) is that it is one of the few realms of our culture in which accountability is viewed as it should be. As coaches, we preach accountability from teammate to teammate, and from teammate to the coaches/ program. But what about coaches’ accountability to the players? Coaches ask for complete faith and trust on the part of the player; often times, however, one can question whether or not the coach deserved that trust from a play calling/ system perspective. As a coach, I was constantly looking for ways to improve my methods. No doubt, many coaches are of the same mindset. However, a completely honest look at many systems will reveal the need for improvement. Formationing that eliminates unnecessary verbiage, while at the same time, minimizes memorization. In the no huddle era that we live in, many teams will simply designate corresponding “L” and “R” words to formation structures. While this may seem like a reasonable solution, it is dependent on rote memorization; this structure minimizes verbiage, and yet has structured rules for each position group. Coding Structure – Create a simple and easily learnable way to code your offense so that it is player-friendly. Communicating Intentions – The coach must accept responsibility to guide the leader of the offense, and have a way to communicate his intentions. System based on player needs – It is the coach’s job to orchestrate and guide; putting the needs of the player ahead of everything in a system is the ultimate in servant-leadership. Carry over – concepts are applicable for every level of the program. Moving the Star Player – The best way to create explosive plays is to get the ball to your play maker. Overcoming injury – The Ohio State Buckeyes did this. Gonzalez builds this factor into the system. Gonzalez explains this and other concepts through text, video, and interactive presentations. 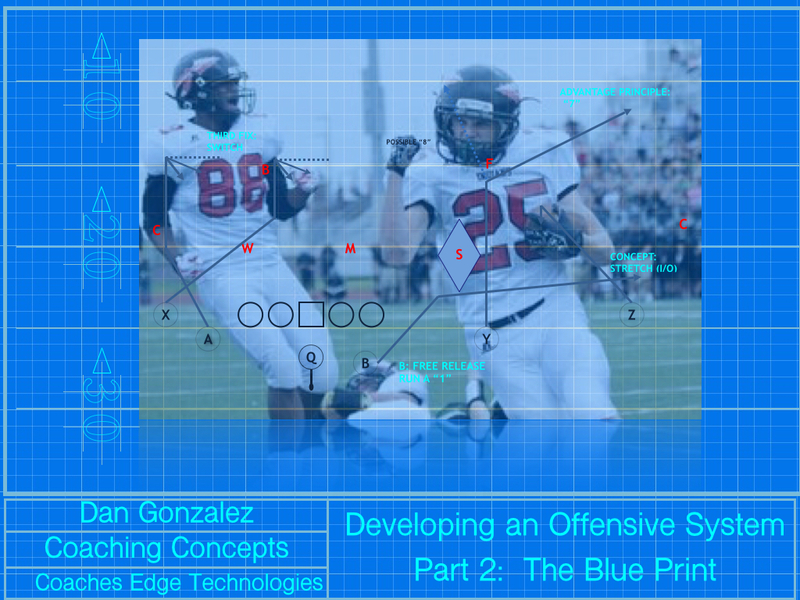 If you are looking to improve your offense, Dan Gonzalez series Developing an Offensive System is a must-have resource. Get Part 2: The Blue Print. Loaded with content. Over 2 hours of video. Coach Bill Mountjoy always passes along great information, and here is some more on an “old school” play that is as effective than ever. Coach Mountjoy is one of Dan Gonzalez’s influences and mentors. 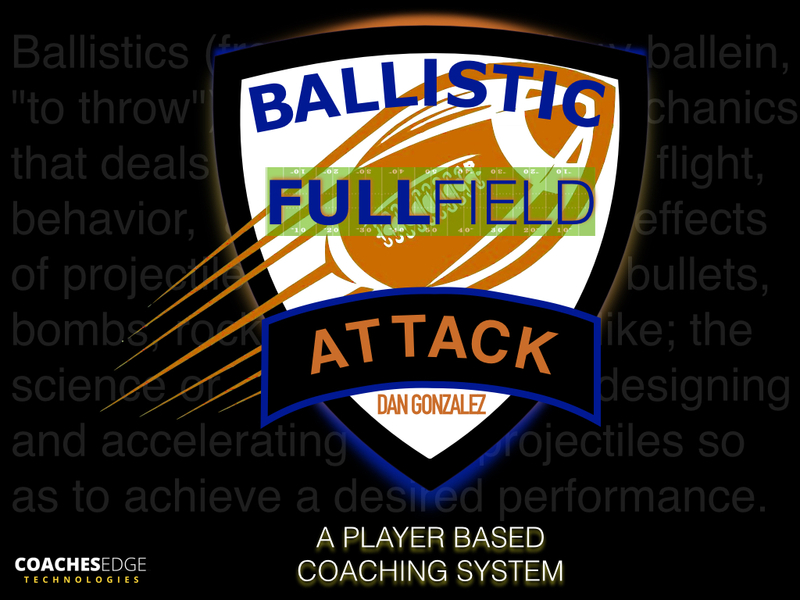 Dan has put together a great series on Developing an Offensive System, with part 1The Need for Change and part 2 The Blue Print available now. 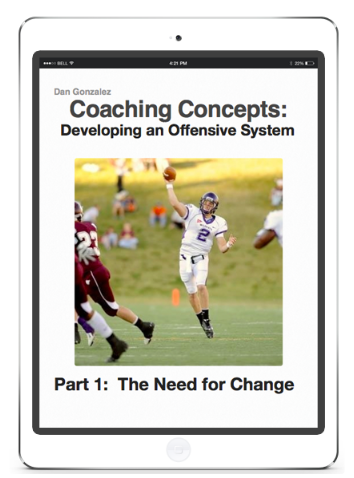 Dan Gonzalez’s iBook is available now for a limited time at $39.99 ($20 off the regular price). Get it here. This iBook is loaded with content. Gonzalez goes into detail on the essentials of putting together an offensive system through instructional video clips and interactives. 60 instructional videos explain concepts and analyze plays in detail. Over 50 multi-angle cut-ups of plays are included for your own review and study as well. The total minutes of video included is just over 2 hours. Learn more about what is included here and here. The introductory sale applies to The Need for Change as well. Get $5 off Part I. Read about The Need for Change here and here. Get it here. If you get both Part 1 & 2, you are getting over 3 hours worth of video as well as text, interactive presentations, and diagrams. Gonzalez put the highest level of detail into these manuals. Last winter my offensive staff and I knew we had a group of players suited to throw the ball. Our run and shoot system was by no means broken, but it did limit some of the the things we wanted to be able to do. After reading Dan’s book Re-coded and Reloaded, it dawned on me that this was the system to use. Installment started in the spring and continued into the summer. The language that he uses allows players to learn quickly. Our kids have commented several times that it is much easier to learn than our former system. His system was an easy transition as it has many run and shoot concepts built in. One of our main objectives was to be able to get our RBs out in to routes out of the backfield. The Gonzalez system more than allows an offense to use all 5 receivers. The best part, though is the rhythm passing and progression allows the QB to make his reads quick and decisive. 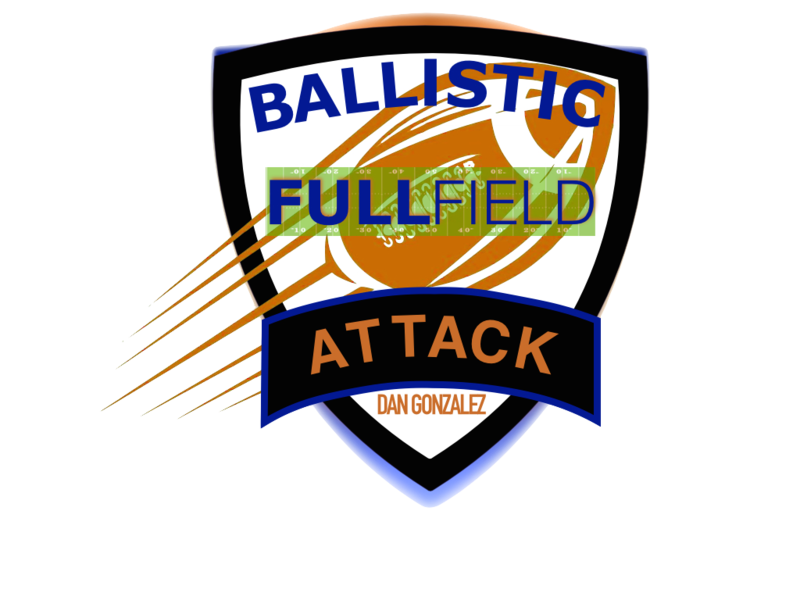 After using parts of it for the first 3 weeks of the season, we have noticed that there is much flexibility in attacking defenses. This is all coming from at team that traditionally runs the football 80% of the time. Dan has been terrific! He is readily available to help explain and give advice. Although we have not changed much of our run game, his passing system has been a wonderful resource for our program. Joe Gibbs’ 3 Step Drop Back Passes (he always said the HITCH was the single most effective play in his offense BECAUSE it was an easy completion that was like a SWEEP which was around the corner & 6 yds. downfield, & it you rolled up to stop it the WR would convert to the FADE (for a big play). So in effect, it was a short pass, a deep pass, and a sweep, all rolled up into one! YOU HAVE TWO MEN SPREAD ACROSS THE FIELD – X AND Z. IF EITHER OF THE TWO MEN IS SINGLE OPEN (CB BAILING), YOU SHOULD THROW TO HIM ALL DAY. IF YOUR OPPONENT SENDS SOMEONE OUT TO HELP COVER HIM, YOU SHOULD RUN! THIS IS THE FIRST THING WE DO. WE CHECK OUR WIDE RECEIVERS. IF THEY ARE SINGLE COVERED, WE GO TO OUR 3 STEP GAME. ALL OF THE ABOVE IS ASSUMING THE CORNERS ARE OFF AND “BAILING”. WE DO NOT LIKE THE 3 STEP GAME INTO HARD CORNERS. SO, IF THE CORNERS ARE OFF AND BAILING – HOW DOES THE DEFENSE HELP THEM? CHECK THE ALIGNMENT OF THE MAN RESPONSIBLE FOR THE FLAT. HE CAN LINE UP IN ANY OF 4 PLACES. A) “HITCH” = YOU WOULD NOT THROW THE HITCH VS. THE “X” POSITION (UNLESS YOU WANTED TO LIMIT YOUR CHOICE TO THE INSIDE RECEIVER). IF YOU THROW IT VS. THE “W” POSITION – YOU HAVE TO READ HIM CAREFULLY AND BE SURE HE IS HELD DOWN BY THE INSIDE RECEIVER. IT IS GREAT VS. THE “F” AND “E” POSITIONS, AND YOU WILL PROBABLY NOT GO TO THE INSIDE RECEIVER VS. THE “E” POSITION. B) “SLANT” = YOU WOULD WANT TO THROW THE SLANT VS. THE “X” POSITION IF HE IS IN AN OUTSIDE SHADE OR HEAD UP (IF HE IS IN AN INSIDE SHADE – DON’T THROW IT UNLESS YOU SPEND A TON OF TIME TEACHING THE “SPECIAL” RELEASE REQUIRED). VS. THE “W” POSITION IT IS VERY GOOD IF THE DEFENDER IS PULLED OUT BY THE INSIDE RECEIVER’S FLAT ROUTE (OTHERWISE – THE SLANT IS TAKEN AWAY AND THE FLAT SHOULD BE THERE). VS. THE “F” AND “E” POSITIONS YOU WILL HAVE TO HIT THE SLANT QUICKLY BEFORE THEY HAVE A CHANCE TO WORK UNDER IT (IF THEY HANG – THE FLAT ROUTE COMES OPEN). C) “UP” (FADE) = THE ONLY PART OF OUR 3 GAME WE REALLY LIKE TO CALL VS. HARD CORNERS. HIT THE W.O. IN THE “HOLE” 18-22 YDS. DEEP BETWEEN THE CORNER AND SAFETY. CAN PUT INSIDE RECEIVER ON A “SEAM” ROUTE UP THE HASH TO HOLD THE SAFETY, OR ON A FLAT ROUTE TO HOLD THE CORNER (WHICHEVER YOU NEED TO DO). PS: We like SMOKE to WR on the backside of Trips (3×1 sets). We like Hitch from 2×2 sets based on FLAT coverage in attachment (generalities). 1. Pivot on the left foot and take a long step back toward the set-up spot with the right foot. Then use cross-over action to the set-up spot. 2. Starting with the right foot, you will take 3 steps and “Stop”, “ready” to pass. You must have stopped and be ready to pass before the receiver makes his final break (on at LEAST 2 steps more than the QB took). 3. Open your shoulders at an angle NOT TO EXCEED 90 degrees to the LOS and look straight down the field, seeing your reads as you go back. Know where you are going with the ball by the time you reach the set-up spot. IT IS IMPORTANT FOR THE QB TO KEEP HIS SHOULDERS AT A RIGHT ANGLE TO LOS, AND HIS FOREHEAD PARALLEL TO THE LOS ON HIS FIRST STEP SO HE CAN SEE THE FIELD. ON STEP 2 & 3 TRANFER YOUR VISION TO THE THROWING AREA. 4. The ball must be held chest high and with two hands. Always be ready to unload the ball quickly. 5. Stop in the “Ready” position without any resetting so you can pass immediately if necessary. A. The 3 step drop is a 1 + 2 step drop, with 1 full stride and 2 short gathering strides – planting on the third step and throw. Always stop with short steps and come to balance before throwing. B. It is coordinated with the quick passing game. Receivers run 5 step breaks. C. Think in terms of the set-up spot being 3 to 4 yards deep. Set up in .8 seconds and throw the HITCH (timing route) in 1.3. 1. First step with your outside foot. 2. Your fifth step will find you on your outside foot (at 6 yards deep). Plant this foot and pivot your inside hip to the outside – staying low and stationary. Turn your eyes to the QB first and foremost. 3. EXPECT the ball to be on the way BEFORE you turn your head. 4. After the catch roll to the outside (you are a broken “arm tackle” away from a score)! A) THE TIMING OF THE DELIVERY IS ESSENTIAL. IT IS THE SINGLE MOST IMPORTANT ITEM TO SUCCESSFUL PASSING! B) GIVE THE RECEIVER 1 SECOND TO GET OUT OF HIS STANCE, AND 1/10 SECOND FOR EACH ADDITIONAL YARD RUN. FOR EXAMPLE: A 6 YARD “HITCH” SHOULD BE COMPLETED BY THE RECEIVER IN 1.6 SECONDS! NOTE: ON A TIMING ROUTE – THE RECEIVER MUST TAKE AT LEAST TWO MORE STEPS THAN THE QB DOES IN SETTING UP (THIS GIVES THE QB .5 SECONDS TO GET THE BALL OUT). C) QUARTERBACK MUST GET THE BALL OUT OF HIS HAND (ON “TIMING ROUTES”) BEFORE THE RECEIVER MAKES HIS FINAL BREAK. FOR EXAMPLE: THE RECOMMENDED TIME FOR THE QB ON THE “HITCH” IS 1.3 SECONDS (IT HELPS ON ALL “TIMING” PASSES IF QB’S ARM COME UP INTO THROWING POSITION AS LAST STEP HITS THE GROUND). D) (QB) IF YOU CANNOT CO-ORDINATE EYE AND ARM TO GET THE BALL AT IT’S INTENDED SPOT PROPERLY AND ON TIME, YOU ARE NOT A PASSER!!! E) KEEPING THE BALL IN BOTH HANDS AND CHEST HIGH IS PART OF THE ANSWER. 1) QB TAKES 3 STEPS (IN .8 SECOND) – ON PASSES WITH BREAKING POINTS OF 6 YARDS. QB GETS THE BALL OUT IN 1.3. The WR on the HITCH comes open at 1.6. Off season start today? Need to see this cutting edge offense. QB produces 1,091yds in two games! Dan Gonzalez is on the cutting edge of offensive strategy. He has a client whose quarterback accounted for a total of 1,091 yards in two games (580yd and 511 yd). 667 yards and 8 touchdowns (no picks) were through the air, and 424 yards and 3 touchdowns on the ground. Yes, the quarterback is very talented, but those kind of numbers are only possible with a great system, and Dan provides an innovative offense. Learn more about in his book. Developing an Offensive System: A Need for Change. Dan Gonzalez explains how to create a system from the ground up, taking into account that the concepts and techniques should be able to be learned at the youth level as well. He’s created a communication system that allows the coach to guide the quarterback’s thought process on the field on a down-by-down basis. Moreover, the teaching and procedures throughout the system demand mutual accountability between the player and coach. Gonzalez’s takes into account everything that is needed to develop a full offensive attack. More resources from great coaches will be coming soon. With many teams now in the second half of the season, it’s worth looking at adjustments to practices and how they can break up the routine that has been created. Little changes can help keep players on their toes and mentally sharp. By this point, players have come to understand the routine which has both benefits and drawbacks. The routine is good because it promotes efficiency. Unfortunately, whether we like it or not as coaches, it creates boredom. Players learn how to perform in those periods, and in some situations, it takes the real game feel out of certain practice periods. Two ares in which we found slight adjustments could be made were in our group periods of inside run and 7 on 7. At this point, the scout team gets pretty good at understanding the offense and playing the play. In order to create a more realistic situation, we changed adjusted periods in our second practice of the week to create a more game like environment for running our plays. We use Tuesdays to install our base offense. Up to this part of the season, we will use inside run, 7 on 7, and team periods to accomplish this. Wednesdays uses the same format with our base runs being repped in inside run, and 7 on 7 and team being focused on our situational offense. In the second half, we found adjusting our Wednesday practice had some advantages…read more. Schemes and plays don’t win games. Execution wins games. You want a game plan that confuses your opponent, but if it also confuses your own players, you will lose. Cleverness is enemy of execution. Thinking is way too slow to work at the highest levels of performance. Players need to stop thinking and react, using finely honed instincts developed through experience. Never deal with hypotheticals. You’ll kill yourself. I could have nine million different scenarios today. I don’t deal with all that. I just deal with what reality is. Chip Kelly at the 2009 Coach of the Year talk: “With our inside zone play. We get so much practice time and so many reps that we can handle all the scenarios that come about. Instead of trying to “out-scheme” your opponent, put your players in an environment where they can be successful because they understand exactly what to do”.